I’ve been absent from Beyond Salmon for so long, you’d think I was gone on another vacation. I wish! But nope, no more vacation for me. I’ve simply been too busy teaching and working. Last Saturday, I lead my first fish market tour in East Cambridge. Those East Cambridgians are a spoiled lot – I’ve never seen this many great fish markets per square mile. I hope my students found it as educational as I did. No matter how many classes I teach, I seem to learn something in every single one of them. Carl from New Deal showed us how to clean soft shell crabs and introduced us to little tunas, called Bonito, and Eddie from Courthouse seafood taught us all about shrimp. Did you know that the green/gray shrimp are farm raised (usually in Thailand) and the pink ones are wild from Texas? I didn’t. Which ones taste better? According to Eddie, the wild ones. It’s on my list of taste tests. When I got home after talking about fish for 2 hours straight, Jason and I had a tasting of two tunas: big-eye (the big guy) and Bonito (the little guy). Instead of my usual sashimi, I made a variation on Tonno Crudo with big-eye (Italian raw tuna dish). 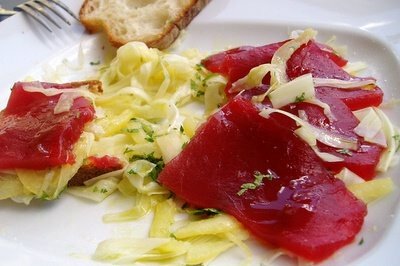 I tossed paper thin fennel slices and slivers of preserved lemon with lemon vinaigrette, and used them as a bed for thinly sliced raw tuna. A little salt, a little olive oil, good crusty bread, and you’ve got a dynamite tuna sandwich. Bonito loins got seared for 30 seconds per side and drizzled with good olive oil. They were sweeter and less meaty than the big tuna, kind of like veal is to beef. Bonito would be a perfect tuna for salad Nicoise. New Deal spoiled me into thinking that every dish deserves just the right tuna. Another thing that’s been keeping me busy is planning the winter semester at the Cambridge Center for Adult Education. Can you believe it? Winter! A large place like CCAE has to do their scheduling and catalog printing way in advance, which means coming up with heart-warming stews and soups in the middle of August. I’ll be offering “One Fish, Two Fish, Red Fish, Blue Fish”; “From Russia with Love”; and a new class called “Deconstructing Deliciousness: What Recipes Don’t Tell You.” What on earth is “Deconstructing Deliciousness”? You’ll find out when you see the catalog. To remind myself that it’s August after all, I thought I’ll post Jason’s recipe for grilled corn. As all of Jason’s gifts to the culinary arts, this one was created by messing up one of my recipes. His “incorrect” version always tastes better than the original, and it becomes the new standard in our house. Instead of grilling the corn and then buttering it, Jason buttered it and then grilled it. Oh, and then he buttered it some more. I know that buttering things before grilling sounds strange. Wouldn’t oiling be more traditional? Just trust me on this one – when Jason screws up, he knows what he is doing. This is the best corn on the cob I’ve ever had. It’s not the amount of butter that makes it so great (2 tsp is hardly extravagant), but strategic use of it at just the right time. 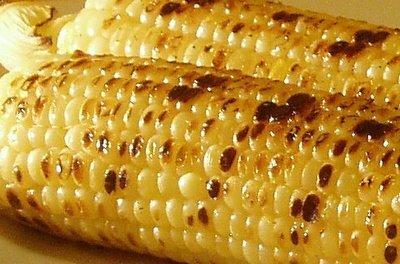 Rub corn all over with butter using about 1 tsp of butter per ear of corn. Rub each ear with another tsp of butter. Sprinkle with salt and dig in. Hi Helen! I just stumbled across your blog yesterday and wanted to say how much I love it. I just can't stop reading. I'm a literary scholar and I'm on a heavy writing schedule this summer, so it's a great distraction from very abstract themes. I'm not a particularly eager cook but it's a pleasure to read such vivid prose and look at you beautiful pics! Your cooking classes must be wonderful. Good luck with everything. Your tuna looks SO red! Yum! Thanks for your kind words about this blog. I am blushing :) Distracting scholars is my specialty. I've been at it ever since my husband started work on his Ph.D.
Hi Helen... where can I get information about the Russian cooking class? I tried the website, but I couldn't find it. My boyfriend is Russian, so I've been cooking Russian for him for over a year now- all from a cookbook I bought. I'd love to take a formal class!